DVDfyi (tm) & CrazyPants Productions Welcome You! Menus are covered under separate Tutorials. Please return to our main page to read the steps for Still Menus or Motion Menus. 6. 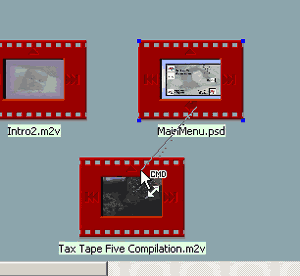 Next import your menu video and audio, if applicable, by dragging the files from the explorer window to the storyboard. Menu creation is covered in separate tutorials. Please refer to our Motion Menu or Still Menu tutorials for step-by-step instructions on those. 7. Finally, import your main video file and its audio track. 8. You now need to determine the chapter locations of your main video, if any. Most often I have found it best to use your NLE to determine the time code of your chapter points before this step. Reel is not designed to play through your video, so the interface, if you tried to, is a little cumbersome. 9. First select the Main video by clicking it once in the Storyboard. 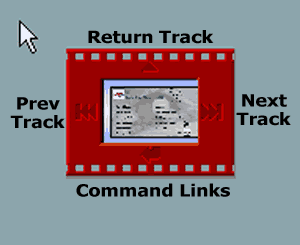 In the track window there will be a green pointer above the video track, along the timeline bar. This will be used to determine chapter location. Holding the CTRL button, click on the timeline to bring the pointer out where it is easily dragable. 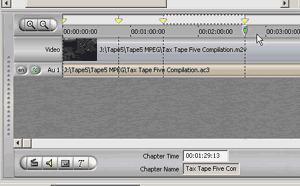 The location of the pointer in relation to the video, as well as the timecode will be displayed in the preview window. 10. Using the timecode you've collected from your NLE, approximate the location on the timecode bar above the video track. Holding down CTRL, click on this location. Drag the pointer to fine tune the timecode location using the display in the preview window as a guide. Once the pointer is where you wanted it, click the "Make New Chapter" button at the bottom left of the track window. You will now have a dashed line across your tracks as shown to the right. Repeat process for the remaining chapter points you desire. Note: It is recommended that you create chapter points in the order you want them. Adding one in between two others can be tricky for a beginner. 11. It is now time to link all of our files together. 12. 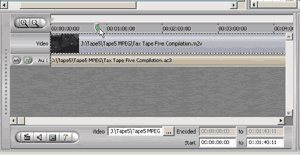 There are four sides and features to the frame around a video file in the track window. The top is to determine a return track. The left determines a Prev Track, or where the user will go by pressing the Prev button on the remote when there is not a chapter to skip back to. The next button is also obvious. The DVD player will play the Next Track immediately after. The Command Link is only found on menus, and it is how we determine your button commands. 13. Click on the command link at the bottom of your menu, and drag it anywhere on top the video file you're linking to. 14. The first thing you'll see is the window to the right. Reel is asking which chapter you'll be linking to in your video. The next step will be to determine which button on your menu will be used for this link. Choose which chapter point you're linking to (the beginning of the track is always chapter one) by clicking it. 15. The "Choose Command Button" window will automatically appear afterwards. Use this window and click on the button you wish to be linked to the chapter you just selected. Continue this process for the rest of the your video and chapters. Note: Linking buttons to other menus is the same process without the Chapter Selection step.